This feature is a part of an ongoing series highlighting DLA's 2018 Downtown Impact Award winners. The Impact Awards recognize businesses or individuals that have made a significant contribution to downtown Lincoln. Bike LNK was the recipient of the 2018 Business Leadership award. 28,000 trips. Eight and a half months of operation. Four years of planning. 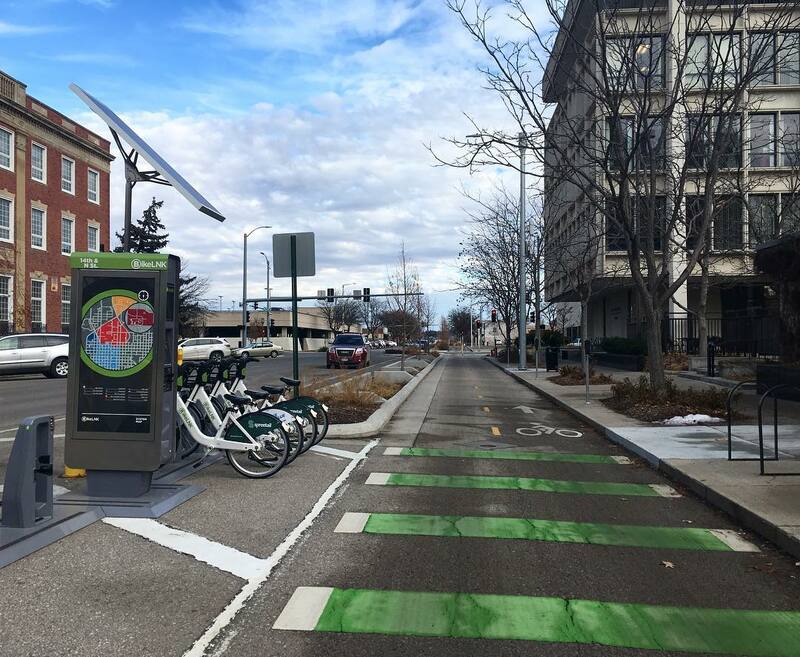 2018 was a big first year for Lincoln’s downtown bike share program. In fact, Bike LNK saw more trips in 2018 than much larger cities’ bike share programs, like Kansas City and Memphis. When a manager position for Bike LNK was posted, Granquist had been happily self-employed as a home childcare provider for the past 17 years. Although she was also a passionate cyclist, Granquist had never heard of a bike share program. Granquist finally appeased her friends by submitting an application. To prepare for her interview, she began researching bike share programs and how they would work in Lincoln. Granquist landed the job in February 2018 and hit the ground running with a small team planning the Bike LNK launch, working on building bikes, and getting 19 kiosks on the ground in downtown Lincoln and the UNL campus. 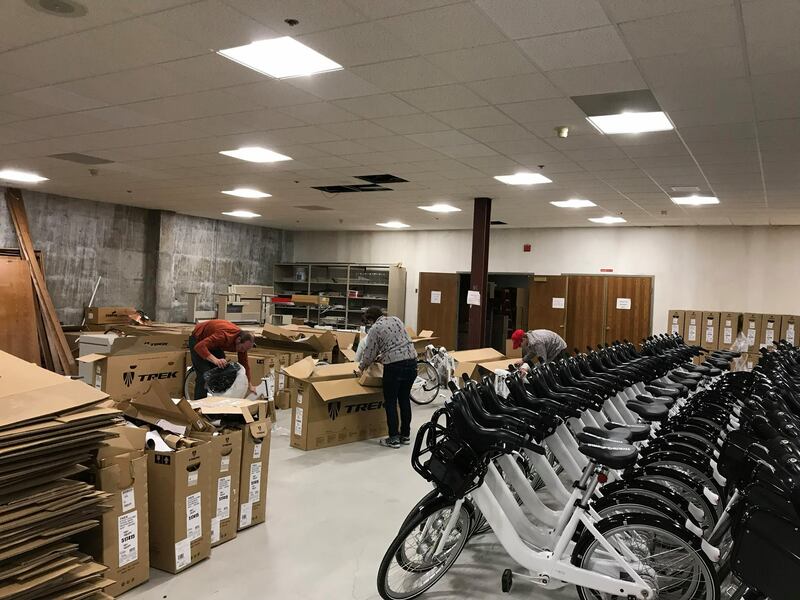 The team shared a round table in a small office and built bikes in the basement of the municipal building at the Lincoln airport—100 bikes in one room take up a lot of space. April 20, 2018 marked the official launch of Bike LNK with a ribbon cutting and celebration in the Railyard. The following two weeks saw 1,500 bike trips. In September, Bike LNK had a high of 5,300 trips. “Everybody was pleasantly surprised about how well it did,” Granquist said. Based off of other midwest bike share systems, the team was prepared for inclement weather to affect their numbers. At a company-wide convention that invited all cities using BCycle bike share systems, the Bike LNK team also was surprised to find that Lincoln’s daily traffic patterns were unusual. Unlike other cities, Lincoln’s bike share experiences a fourth “bump” in numbers following the usual spikes in usage in the morning, at lunchtime, and for the commute home from work. Granquist said everyday since the launch has been a learning opportunity, and everyday is different. Her love for Lincoln and natural love of biking and road infrastructure has made the position a great fit, along with the whole Bike LNK team. Now located in a building on South Antelope Parkway, the Bike LNK staff has a bike rack—and no need for a parking lot. Granquist’s advice to people who are wanting to use the bike share program but are unsure of where to begin is to start small and make small goals. Granquist said she is proud to say that Bike LNK’s inaugural success in 2018 was a collaborative effort from a lot of passionate people. 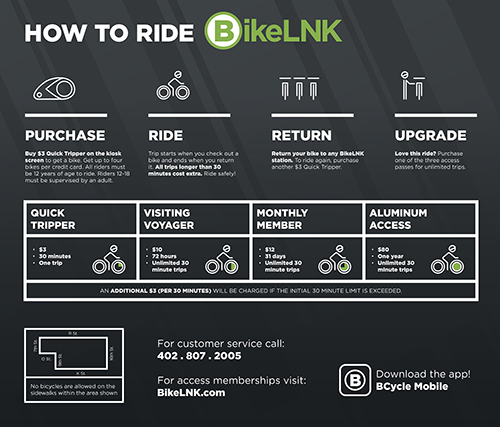 Learn more about Bike LNK and become a member at bikelnk.bcycle.com.